➚➚ Uncertainty in the security and resource sectors for all actors, states and companies alike, involving a complete redrawing of the influence map, of the capabilities needed and relatedly of the strategies and policies to develop and implement. In April and May 2018, China has carried out successful deep-sea missions which indicate China’s willingness to develop its influence and use also to this extreme environment, among the four we monitor: the extremely cold in the North – the Arctic – and in the South – Antarctica, space, and the deep-sea. As a result, China shows a resolve to implement a truly planetary strategy not only located at the surface of the planet, somehow conceptualising the world in two dimensions, as with the Belt and Road Initiative (BRI), but also considering height and depth, thus in 3 dimensions, with space on the one hand, the deep-sea on the other. Between 4 April and 16 May 2018, China endeavoured a month-long deep-sea exploration in the South China Sea, using a Canadian unmanned submarine, more precisely a Remotely Operated Platform for Ocean Science (ROPOS). Not only could the expedition transfer data in real-time and allow scientists and students to discover in real-time the new world of the deep-sea, but also it identified the location and nature of precious future resources. The exploration thus found: “the biggest ferromanganese nodules”, which notably “contain nickel, chromium and manganese, minerals that are indispensable for military equipment, such as submarines, tanks and aerospace facilities,” as pointed out by a Chinese advisor to the Hainan Provincial Maritime Environment Protection Association. 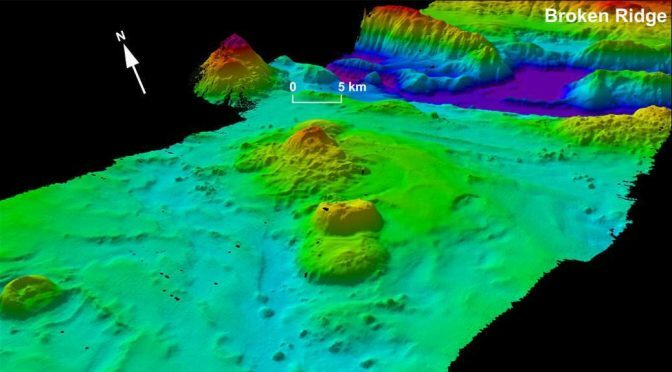 It also found “two ancient hydrothermal vents on the seafloor”, which fluids “provide[s] clues to the form of metals”. Meanwhile, China is also developing its own manned and unmanned submersibles for the deep-sea, while developing and testing interoperability and communication. For example, from 28 to 30 April 2018, “The manned deep-sea submersible Shenhai Yongshi, or Deep Sea Warrior, and unmanned submersible Haima, or Sea Horse, completed three joint deep-sea operations in the Haima cold springs in the South China Sea”. Here the resources targeted were natural gas hydrate, which could contribute to replace in the future oil and gas. Estimates give 2020 as target date for first small-scale output and 2030 for large-scale commercial exploitation (The Independent). Real exploitation of this deep-sea resource has already started in China, as, in 2017 the country is reported to have “extracted more than 300,000 cubic meters of combustible ice, a type of natural gas hydrate (People’s Daily)”. Considering the location of the so-far identified main sources of natural gas hydrate, China, in the meantime, also calls for cooperation with the countries in the disputed region, namely the Philippines, Indonesia and Vietnam. We may estimate that China will probably develop here a strategy and related policies akin to the BRI. As another example, on 23 April, “China’s self-developed 4,500-meter-level unmanned submersible Qianglong 3” (diving dragon) “conducted its first dive in the South China Sea”. The Qianglong series is “developed by the Chinese Academy of Sciences’ Shenyang Institute of Automation”. Among a host of improvements compared with previous versions, it is also meant to be much more silent, which could have direct consequences in terms of military espionage and submarine warfare. Finally, China is reported to plan a new base located in Sanya for deploying manned and unmanned submersible vehicles in the South China Sea, which should be completed by 2019. If China is seen as having to catch up in terms of submarine warfare according to Jane’s Defence/IHS Markit (Sputnik), it is making much effort in this direction. Meanwhile, to evaluate China’s efforts in terms of manned and unmanned submarines only according to warfare could be a dangerous approach, as all silo-based understanding. It could indeed neglect diplomatic impacts and influence’s impacts, consequences in terms of resources security and, ironically, capability to develop next generation of weapon systems, if necessary components are seabed resources dependent. The month-long deep-sea exploration of the South China Sea ended Wednesday with the discovery of polymetallic nodules and ancient hydrotherm which will help in exploiting metal resources and will provide the materials needed to manufacture military and aerospace equipment, observers said. About 22 Chinese scientists began one month of live-streaming deep-sea exploration of the South China Sea on Tuesday. China’s two deep-sea submersibles have completed their first joint scientific research in the South China Sea, paving the way for future natural gas hydrate explorations in the region, an analyst said Wednesday. Commercial development of the globe’s huge reserves of a frozen fossil fuel known as “combustible ice” has moved closer to reality after Japan and China successfully extracted the material from the seafloor off their coastlines. But experts said Friday that large-scale production remains many years away – and if not done properly could flood the atmosphere with climate-changing greenhouse gases. Just after the likely next head of US Pacific Command told Congress China’s undersea warfare capability is one of the most pressing threats to the US, a new report says Beijing is establishing another base in the South China Sea for deploying manned and unmanned submersible vehicles. Posted byDr Helene Lavoix (MSc PhD Lond) May 28, 2018 June 2, 2018 Posted inAmericas, China, Deep Sea Resources Security, East Asia and Pacific, Energy Security, Horizon Scanning Board, WarTags: China, deep-sea, drones, energy, featured, Open Access, seabed, seafloor, U.S.